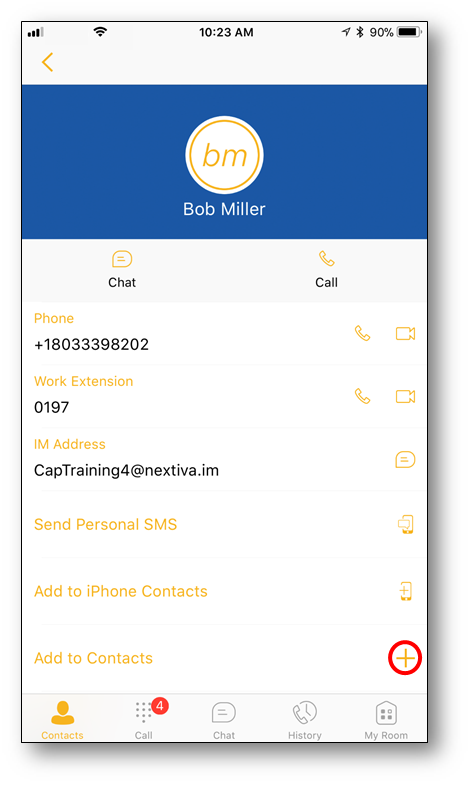 All Contacts in an organization within the Nextiva system are pre-loaded into the Directory when first logging in to the Nextiva App. The Directory contains all of the Auto Attendants, Call Centers, Call Groups, and Users that are in the Nextiva system. 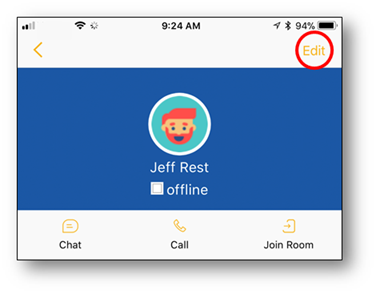 Adding a Contact to Contacts is one of the ways users can chat with other Nextiva App users in the organization, and easily communicate with them without having to scroll through the entire list of Directory Contacts. Think of Contacts as a user’s own Nextiva App phonebook. The easiest way to add a Contact if the desired Contact is part of a user’s organization is through the Directory. 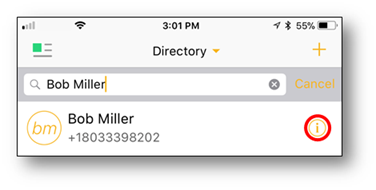 Adding Contacts from the Directory makes it quicker to find Contacts in a user’s organization that he or she communicates with often, without needing to scroll through the entire company list every time. While on the Contacts screen, select the drop-down arrow at the top of the screen (Figure 1-1). 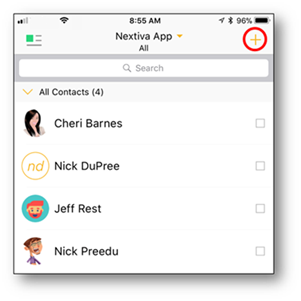 Nextiva App Contacts: A short Contact list, typically used for instant messaging and Team Presence, which shows personalized frequently contacted numbers. For more information about starting a chat, click here. Contact Directories: This includes Contacts in both the Local Address Book and the Directory. These Contacts are fully customizable, and do not have to be on the Nextiva network. When going off-net, Team Presence and video chat will become unavailable. Once in the Directory, use the search bar at the top of the screen to find the Contact and select the information symbol to the left (Figure 1-3). 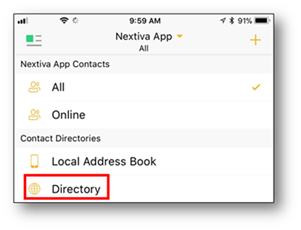 Once the Contact Profile has opened, select the plus sign to the right of Add to Contacts near the bottom of the screen to add the User to the Nextiva App Contacts List (Figure 1-4). 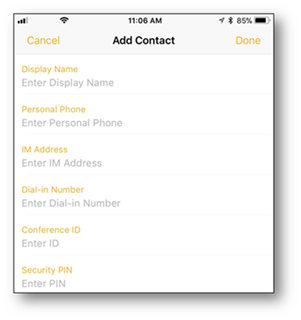 Note: Selecting Add to iPhone Contacts will add the Contact to the local cellular phonebook. Manually inputting Contacts is required if the Contact being added is not in a user’s organizational Directory. 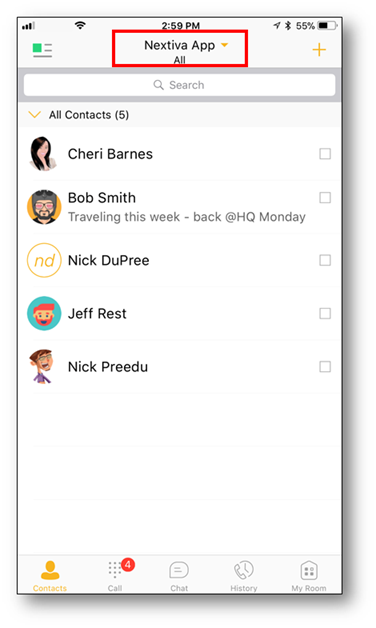 The new Contact can be part of any Nextiva system to take advantage of Team Presence and chat, as well as any contacts outside of the network a user wishes to contact through the Nextiva App. 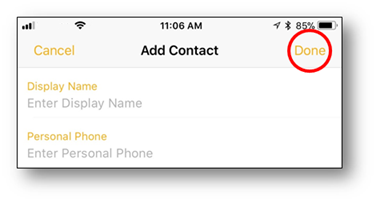 While on the Contacts screen, select the plus sign in the upper right corner and select Add Contact (Figure 2-1). Select Done to save the new Contact (Figure 2-3). 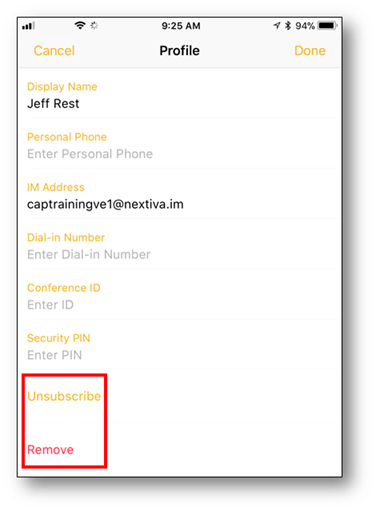 Once the Contact is saved, the Contact will be located in the Nextiva App Contacts – All section for easy access. There are two levels of Contact removal. To access these levels, locate the Contact in the Nextiva App Contacts – All section and select the Contact to open his or her Profile. In the upper right corner, select Edit to open the menu (Figure 3-1).